At first glance, today's visually savvy students may consider a broadside just another text-based document. Yet a thoughtful, methodical evaluation of a broadside can demonstrate how a low-cost and low-tech medium could influence people. 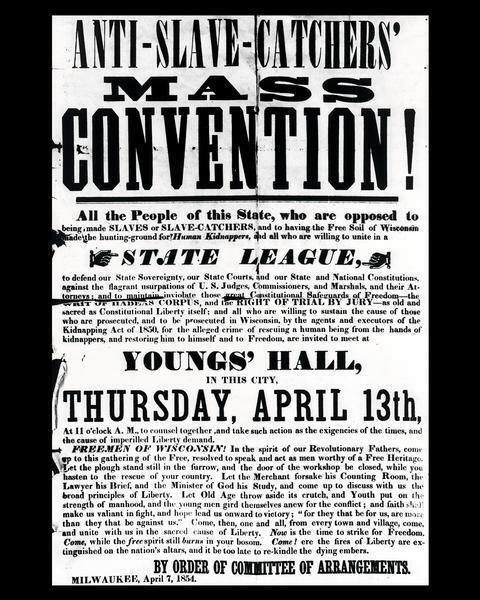 In this lesson, students will take a closer look at an 1854 broadside from Milwaukee to learn more about the medium as well as Wisconsin's response to the Fugitive Slave Law. As explained in the television program Laboratory of Democracy, in the 1850s abolitionists from southeastern Wisconsin directly challenged the controversial Fugitive Slave Act. This broadside from the Wisconsin Historical Society's collections offers valuable insights into the views of Wisconsin's abolitionists. 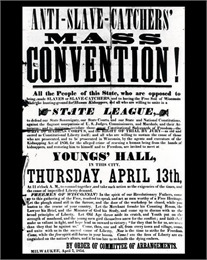 Abolitionists distributed the document in Milwaukee only three weeks after the dramatic capture and rescue of Joshua Glover, an escaped slave from Missouri. Like television commercials in our time, broadsides were usually produced for some passing commercial or political purpose. Unfortunately both for researchers seeking valuable documentation and for teachers desiring visual materials for students, earlier generations rarely saved broadsides for research libraries and archives. Due to the technological limitations of print shops in western America, broadsides remained a standard form of communication in the 1850s. Unlike their rapidly maturing offspring, posters, broadsides had limited artwork and color. The basis of an effective broadside was powerful and persuasive text. Designers had to catch the attention of potential readers with large print and then convince them to act with a brief text. To whom is the document addressed? The following questions can be adapted for classroom discussion or used as part of a written assignment. For discussion purposes, consider making an overhead transparency of the broadside. Each student should receive a photocopy of the document. How does the information in the document connect with the historical context of the mid-1850s? Ask students to identify the central argument made in the text. Specifically, identify two points the author makes to support this argument. How does the author refer to the Fugitive Slave Act of 1850? What political party do you think the author of the document supported? Explain. Direct students to study the design and layout of the document. Visually, what words and phrases are emphasized? Your U.S. history text probably has other examples of broadsides and posters. Have students compare the two media, evaluating the communication techniques of both. Broadsides like this document served to inform and to persuade people in an age before mass-circulation newspapers. Direct students to design a broadside about a contemporary injustice or social issue. See if they can find evidence of "broadsides" today in the form of bumper stickers, T-shirts, billboards, etc. Encourage students to include all the elements that make up a broadside, including a logical written argument, patriotic slogans, religious references, and visual design. A version of this lesson plan was developed by the Office of School Services as part of the Wisconsin Stories online activity guide for the secondary-level classroom. Please adapt it to fit your students' needs.